In honor of today’s big solar eclipse, were serving up a classic Celica Sunchaser for our Nice Price or Crack Pipe challenge. Let’s see if its price can send you over the moon. You may have felt last Friday that we had stepped into an episode of Ballers, seeing as our contender was a 2008 Dodge Challenger SRT8 that had once been owned by St. Louis Rams offensive lineman Chris Williams. That Dwayne Johnson-led series occasionally dips its toes into the very real issue of concussive injury suffered by gridiron players. You however, don’t have to have had your bell rung to slaver over that 1000-horse coupe, nor to attend the whine tasting its Kenne Bell blower is serving up. In fact, that car was compelling enough that its $40K price tag still managed to eke out a 52 percent Nice Price win. And that was in spite some serious power-related component failures well documented in its past. Talk about going for it! Are you going to be somewhere today were you will be able to witness the solar eclipse? If so, are you preparing your sacrifice to the sun god to ensure her safe return preventing us from being thrown into a perpetual twilight? I certainly hope so since those Twilight movies sucked harder than the glitter-covered vampires that inhabited them. I suggest pouring out a bottle of Night Train on the curb at maximum occultation for good effect. 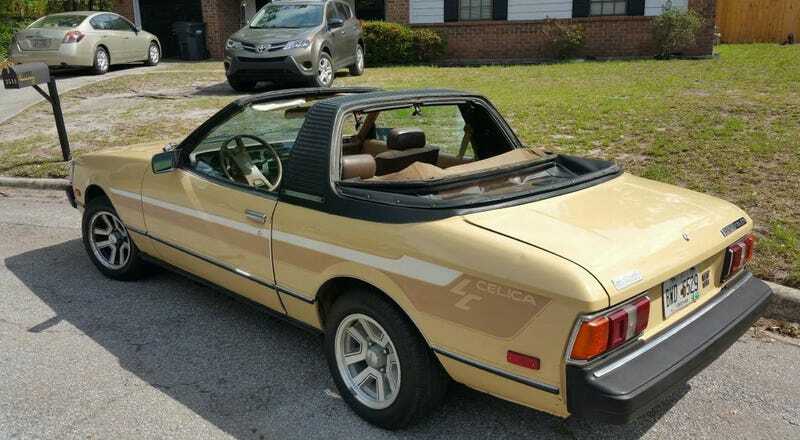 For those of you not planning a pagan ritual to ensure the sun’s timely return may I suggest having a look at this 1981 Toyota Celica Sunchaser instead? As you most likely know, the Sunchaser was a post-factory convertible mod created by Griffith Inc., and at one time sold through participating Toyota dealers. Approximately 2000 cars were so converted, fitted with a padded targa-style roll-over hoop, soft rear roof section, and fiberglass hard roof spanning the space above the front seats. This beige over tan edition sports a claimed 42,000 miles and an odd side stipe that has “LC” at the end. To the best of my Google-fu there wasn’t a Celica LC, and I don’t think that it references the Toyota modding house LC Engineering. If however, your name happens to be “Lucious Caboose” this may just be the car for you. Power is provided by a 90-bhp 2,189-cc 20R engine that the seller says comes with a new Weber carb. Backing that up is a W50 five-speed stick to make the most of the car’s 90 horsepower. Fortunately, the Sunchaser tips the scales a few pounds lighter than a standard hardtop coupe. That will allow for several vital nanoseconds off the factory 12-second zero to sixty time. 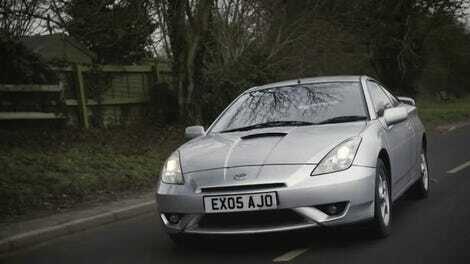 Wheels are later Celica GT/Supra alloys which look pretty good on the car. The body shows some signs of road rot in the rockers and there’s a couple of annoying scrapes and dents on the sides. Other than that, and the pretty underwhelming color choice, it all looks perfectly serviceable. The interior likewise looks a little worn but not so much as to be pulled from active duty. There’s some de-lamination on the rear side panels and the seatbelt snood has yanked loose on the one side. Perhaps making up for that is a police baton behind the driver’s seat to ward off complainers. We don’t get to see either the rear fabric top raised nor the fiberglass center section in place but the ad doesn’t say that either is in crap shape or missing. The plastic back window does seem to be clear which is a good sign. Those fabric sections are available for replacement, but the fiberglass center section is apparently next to impossible to find. Hopefully this one’s is in the boot. The rubber around the openings is all a bit on the grody side. The ad notes that the car is “solid” and has been “garage kept.” Not only should it provide some old school fun to drive, but it would no doubt be a hit at the local Cars & Coffee event, just look out for the Mustangs! How much does it cost to chase this Sun? The asking is $2,500 and we now need to decide if that’s a deal, based on its ad. And, we’ll need to do so before the lights go out. What do you think, does this Sunchaser seem worth $2,500? Or, does that price leave you in the dark? Savannah, GA Craigslist, or go here if the ad disappears. At $40,000, Would This Custom 2008 Dodge Challenger Give ‘Em Hellcat?